Winner Drawn on Thursday, December 7th at 5 PM. 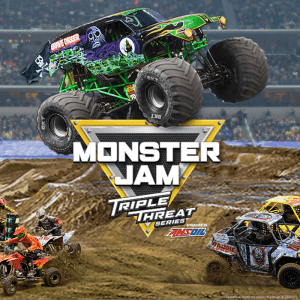 Feld Entertainment, the worldwide leader in live family entertainment, announced today that tickets for Monster Jam® are on sale now for select cities across the U.S. and Canada. The new season will bring motorsport fans to the edge of their seats with adrenaline-charged, high-flying, four-wheel excitement that is fun for the entire family. Unexpected, unscripted and unforgettable, Monster Jam takes center stage in the world’s most iconic venues, sporting meticulously manicured dirt tracks created with the sole purpose of pushing these perfectly engineered, larger-than-life trucks to the limit. Monster Jam is one of the only sports where male and female world-class drivers, some generational rivals, are equals competing for the same championship on the same track. Following racing, new in 2018 across all Monster Jam events, fans in every city will have the chance to vote for the truck winner in the two-wheel and freestyle competitions by real-time, in-stadium fan voting on their smartphones. New in 2018 for stadium events only is a Pit Party Early Access Pass available for purchase with an event ticket. for Saturday Pit Parties The upgraded pass provides early entry in to the Pit Party from 1:30 – 2:30 p.m. and the opportunity to get up close and personal to the Monster Jam trucks and drivers. It also will serve as a regular Pit Party pass from 2:30 – 5:30 p.m. with the general public. Monster Jam drivers are only in the Pit Party signing autographs until 5 p.m.